Coverage focused on the call for European integration has largely glossed over the rise in nationalist rhetoric that has led to violence. Kiev’s two-month-long “Euromaidan” protest turned violent on Sunday as people in masks, outraged over restrictive protest laws hurriedly passed last week, marched on parliament and ran into police cordons that they pelted with stones and Molotov cocktails. Police hurled gas canisters, stun grenades, and a water cannon and rubber bullets at them, setting off a wave of clashes previously unknown at the largely peaceful protest. Spearheading the clashes with police was Right Sector, a group with ties to far-right parties including the Patriots of Ukraine and Trident, which BBC Ukraine reported is largely comprised of nationalist football fans. In a statement the next day, the group claimed credit for Sunday’s unrest and promised to continue fighting until President Viktor Yanukovich stepped down. “Two months of unsuccessful tiptoeing about under the leadership of the opposition parties showed many demonstrators they need to follow not those who speak sweetly from the stage, but rather those who offer a real scenario for revolutionary changes in the country. For this reason, the protest masses followed the nationalists,” the statement read. The surge in violence sparked by Right Sector has revealed how uncritical and undiscerning most of the media has been of the far-right parties and movements that have played a leading role in the “Euromaidan,” the huge protests for closer ties to Europe that flared up in November and have taken over Kiev’s Independence Square (“Maidan Nezalezhnosti”). Protest coverage focused on the call for European integration and the struggle against the Yanukovich regime has largely glossed over the rise in nationalist rhetoric, often chauvinist, that has led to violence not just against police, but also against left-wing activists. According to Maksim Butkevich of the coordinator of the No Borders Project of the Center for Social Action NGO, which works against discrimination and xenophobia, far-right groups have grown in popularity over the course of Euromaidan. “I wouldn’t say it’s big, that huge numbers of activists will join far-right groups after this, but they became more acceptable and in a way more mainstream than before for many active citizens,” Butkevich said. It was Svoboda that was responsible for the most iconic image to come out of Euromaidan: On December 8, masked protestors waving blue Svoboda flags and yelling “Hang the Commie!” toppled a 67-year-old statue of Vladimir Lenin in the city center. Svoboda leader Ihor Miroshnychenko, who has faced charges for pulling down a Lenin statue in another city, told journalists his party was responsible. Svoboda is the most visible party on the square, it has essentially taken over Kiev City Hall as its base of operations, and it has a large influence in the protestors’ security forces. Progressive activists have “to fight on two fronts, against a regime that supports harmful police violence … and also against extreme nationalism, which is recognized and legitimate on Maidan,” Nikita Kadan, an artist and activist in Kiev, said via Skype during a discussion of nationalism at a Moscow bookstore in December. The Euromaidan protests began on November 21 after the government halted the process of signing an Association Agreement and a Deep and Comprehensive Free Trade Agreement with the European Union. The EU offered Ukraine what many have framed as a “civilizational choice” between East and West, which have recently been at odds over a traditionalist social agenda—including a controversial law against gay propaganda—implemented under President Vladimir Putin in Russia. The association agreement would have reduced tariffs but would not have led automatically to visa-free travel or the ability for Ukrainians to work in Europe. (EU politicians and even Senator John McCain have come to Kiev to stump for European integration, and McCain had dinner with Svoboda’s head and the two other leaders of the opposition coalition.) Instead, President Yanukovich, who is from the generally Russian-speaking eastern half of the country, later signed an agreement with Putin that will see Russia buy $15 billion in Ukrainian government bonds and discount the gas it delivers to Ukraine by a third. The protests come amid a resurgence of nationalist sentiment in Ukraine that can be compared to a Europe-wide rise of nationalist parties. Svoboda, which was originally known by the Nazi-esque moniker “Social-National Party of Ukraine” and whose leader Oleh Tyahnybok is infamous for a 2004 speech in which he argued that a “Moscow-Jewish mafia” was ruling Ukraine, entered parliament for the first time in 2012 by winning 10.44 percent of the popular vote. Before this, the party had come to dominate regional parliaments in three provinces in the largely Ukrainian-speaking west of the country. In last year’s elections, Svoboda notably finished second in cosmopolitan, Russian-speaking Kiev. “In the 2010 and 2012 elections, it became visible that a big part of the youth are moving toward nationalism,” said Georgy Kasyanov, a researcher at the Institute for the Development of Education. He noted that one factor is youth unemployment, which is rising in Ukraine as in the rest of Europe. Despite its leading role at Euromaidan, Svoboda’s political program is at complete odds with the “European values” for which the protestors at Euromaidan are ostensibly agitating. (Admittedly, some of the party’s populist economic program is in fact relatively progressive.) During its time in parliament, the party was best known for introducing a bill to ban abortions, but in its program, it also promises to abolish gun control, “ban the communist ideology,” criminalize “Ukrainophobia,” ban the adoption of Ukrainian children by foreigners and reinstate a “nationality” graph on passports and birth certificates. 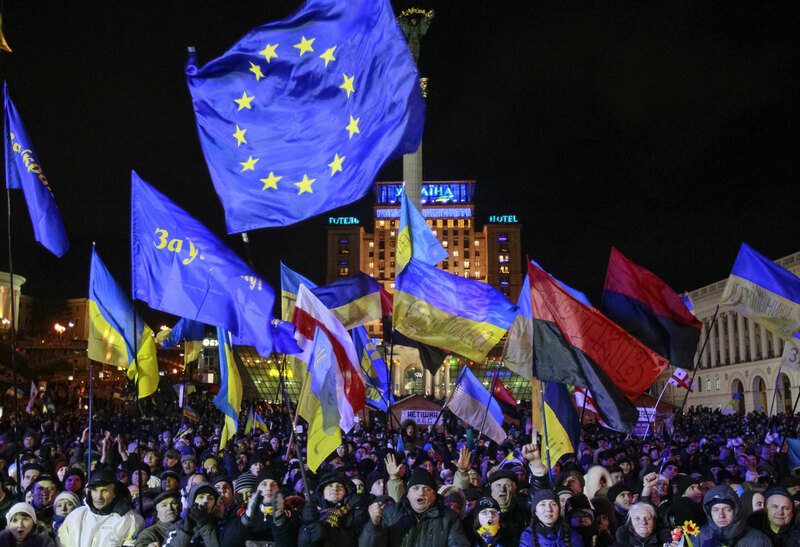 How can the slogan “Ukraine above all!” sound on Independence Square alongside the slogan “Ukraine in the EU!”, Ukrainian progressive activist Olga Papash asked in a recent piece on the politics and culture website Korydor. Any ideology has a certain point that integrates dissimilar ideas into a single system, Papash argued. “I think the attachment point, that shared place of rightist ideology in Ukraine today, that ‘ideal’ that removes the contradiction between different calls to action and messages, is the fear of (dislike of, reluctance toward) entering into any sort of ‘civilized’ relationship with Russia,” Papash wrote. Even Yury Noyevy, a member of Svoboda’s political council, admitted that the party is only pro-EU because it is anti-Russia. “The participation of Ukrainian nationalism and Svoboda in the process of EU integration is a means to break our ties with Russia,” Noyevy said. For now, Svoboda and other far-right movements like Right Sector are focusing on the protest-wide demands for civic freedoms government accountability rather than overtly nationalist agendas. Svoboda enjoys a reputation as a party of action, responsive to citizens’ problems. Noyevy cut an interview with The Nation short to help local residents who came with a complaint that a developer was tearing down a fence without permission. Kruk freely admitted she doesn’t support Svoboda’s nationalist platform and “would be very concerned” if the party won a majority in parliament. Nonetheless, she volunteers for Svoboda because she likes “the idea of a party that is Ukrainian-focused” and thinks it is the most active of the opposition parties. This kind of reserved support of Svoboda as the party most likely to enact change despite its intolerant rhetoric was echoed by several protestors on Independence Square. Katerina, a doctor who also declined to give her last name for fear of repercussions at work, said although she disagrees with Svoboda’s nationalist program, she supports them “for now” for their strong anti-oligarch stance. “They’re not afraid to make demands,” she said. Alexander, who came to Independence Square from a village outside Kiev, said that the nationalists have been essential to the growth of Euromaidan. “Without nationalists, there wouldn’t be any protest,” Alexander said, declining to provide his last name. Nonetheless, some left-wing parties, including the Marxist party Borotba, don’t support the protests because they worry about the growing power the demonstrations have given to Svoboda. Their concern alludes to a darker side to patriotic hymns and sayings. The fact that nationalist slogans “became mainstream of course points to the danger of providing greater legitimacy to groups promoting positions that yesterday were really marginal, and this danger is still in place,” Butkevich of No Borders said. On December 4, labor organizer Denis Levin and his two brothers were beaten by a small crowd shouting “Glory to Ukraine” and “Death to Enemies” after a nationalist writer on the stage pointed them out as “provocateurs” with red flags, Levin told The Nation. Shortly before and after the attack, Miroshnychenko, a member of Svoboda’s political council, came by the tent where the brothers were agitating for the Confederation of Free Labor Unions, Levin added. The nose of one brother was broken, and Denis suffered from the irritative gas used against the trio. Men wearing armbands with the wolfsangel nationalist symbol also started the violent clashes on nearby Bankova Street on December 1 that led to riot police counter-attacking and beating journalists, photos from the incident show, although it’s not clear in whose interests they were acting. “People are not thinking about how an association with the EU will actually affect us, they’re still finding simple answers for complicated questions. They are blaming the Moskali for everything,” Levin said. However, Noyevy denied Svoboda activists had beaten the Levin brothers. Former Svoboda member Ivan Ponomarenko, an architect from Kiev, said the party is ineffective politically and will not be able to enact its measures, as its leadership is only “pretending” to be extreme nationalists for their own political and economic gain. “They are playing at Klu Klux Klan,” Ponomarenko said. But political analyst Kost Bondarenko, commenting on Svoboda’s recent torch-lit march in Radio Free Europe/Radio Svoboda’s Russian service, said that as the dominant far-right political party, Svoboda could benefit politically from any continuation of radical actions at Euromaidan. “Any radicalization on the right, and Maidan is right-wing in its essence and ideology, will lead to a growth in the ratings … of this political force,” Bondarenko said. “On the other hand, such a turn of events is desirable to the authorities, I think, since Viktor Yanukovich understands that he will win if Oleh Tyahnybok makes it to a second round” in the presidential election in 2015. For his part, a bright-eyed Noyevy promised to implement a radical nationalist platform.